Thanks to Benny in N. Cal for the recommendation! Streamed this one on Netflix yesterday, Here goes! 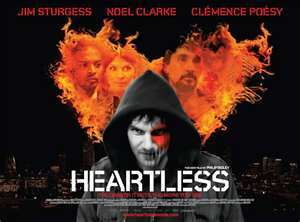 Heartless is a 2009 horror film from the UK. This is the story of Jamie Morgan (Jim Sturgess), a young man with a large, heart-shaped birthmark over the left side of his face. The birthmark has made him the target of ridicule his whole life, and presumably has completely crippled him socially, as he lives with his widowed mother in a flat. The city is rife with thugs, and gangs of violent, aimless youths. Jamie happens upon a gang of them one night and is shocked to see they are not human. They are reptilian looking demons. He begins noticing the demon gang's graffiti around the neighborhood, and sees and hears all the reports of their evil deeds, which include torching individuals with molotov cocktails. Ultimately, he and his mother are accosted by the demons, and they torch his mother right in front of him. This, coupled with the loss of a new friend to the demons, drives him to buy a handgun and try his hand at being a vigilante. Getting even doesn't last to long as he meets a mysterious little girl and her Papa (played by Joseph Mawle). 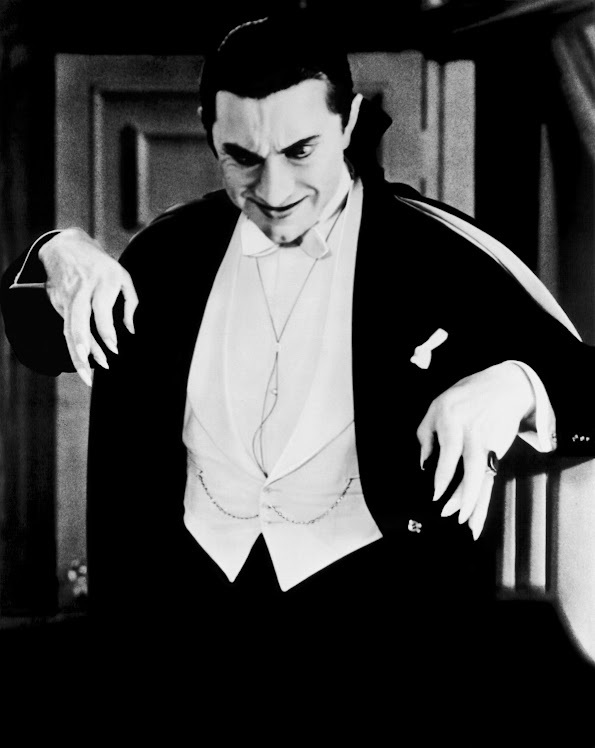 Papa B, as he's called, appears as a disfigured man, but possesses supernatural powers. He offers Jamie the wish to not have his birthmark so he can fall in love and have a family of his own, which his mother wanted for him. All he has to do in return is contribute to the chaos in the city a little, by doing graffiti once in a while. Jamie decides to accept the exchange, and is transformed. Everything seems to be going well, until Jamie discovers that he's been deceived, and the price he must pay for his gift is much more involved and terrifying than he was led to believe. This movie was enjoyable, overall. The acting was really good, the pace was adequate, and I really felt for the lead character in his quandary. I did have some issues with it, however. Some of the CGI used to make the demons' faces was sketchy, I also felt that Jamie's character kind of fell to the dark side a little too quickly, given his close relationship with his pious, loving mother. I don't want to give the ending away, but I think it was a bit rushed in relation to the levity of the situation he was in. The ending also is not a typical "horror movie" ending, so that might be worthy of your consideration. I give Heartless a 7 out of 10. Worth a watch! gonna MISS horrojungle it was the best place to find out all about horror movies and the ratings were a nice guide. t.h. Doesn't sound like a vampfilm but good nonetheless. Will check it out on the Flixster. I am going to miss all the horror recommendations provided on the show. It was really awesome. Hola Jungle hosts this is Lou from Hawaii and I support the podcast n I thank you for the episodes provided. It was a fun n exciting show. Good luck to all and I hope you hosts wont disappear n stay in horror. It is a pretty good movie, let me know what you think of it! Thanks for listening, reading and posting! I very much appreciate it! Thank you for the positive feedback! Believe me we enjoyed making the podcast as much as you all liked listening! As far as the other hosts, we aren't going to disappear. Stop in when you get the time, and I will fill you all in as news becomes available. Until then, visit the hosts websites, and please feel welcome to post feedback! Wonderful line up. We are going to be linking to this excellent write-up on our web site. Sustain the great composing.